Celebrate the Declaration of Independence year round with the Whitehall Standard Life and Liberty Wall Plaque. This lovely sign immortalizes the words of the declaration in a stylish and lasting way. A rippling flag in relief rests under the small arch at the top of the marker, followed by the phrase "Life, liberty and the pursuit of happiness" in all caps. The space beneath this quotation displays your personalized information, accommodating up to five 3" tall characters. The custom information is cast per order, for a unique item whose information can never fall off of the sign. Mount this plaque to a wall or other flat surface using the two predrilled holes. The aluminum construction creates a durable marker, and the weather resistant paint stays vibrant through the seasons. 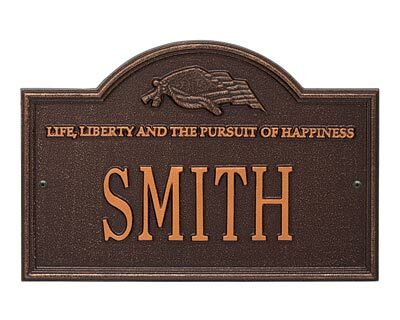 Add an enduring symbol to your home with this Standard Life and Liberty Wall Plaque. Made in the USA. An antiqued plaque with copper characters is pictured using the color code "AC".